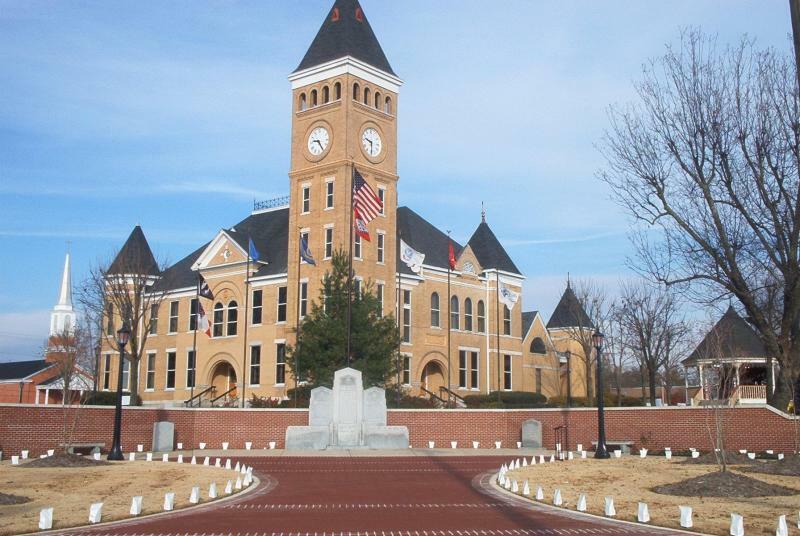 For the city of a similar name, see Bentonville, Arkansas. For the county of the same name, see Benton County, Arkansas. Saline County Courthouse, located in the heart of downtown Benton. Benton is a city in and the county seat of Saline County, Arkansas, United States and a suburb of Little Rock. It was established in 1837. According to a 2006 Special Census conducted at the request of the city government, the population of the city is 27,717, ranking it as the state's 16th largest city, behind Texarkana. However in the 2010 census, the city population increased to 30,681, making it the 12th largest city in the state of Arkansas. It is part of the Little Rock–North Little Rock–Conway Metropolitan Statistical Area. The city of Benton, first settled in 1833 and named after Missouri Senator Thomas Hart Benton, was formally chartered in 1836 when Arkansas became a state. As of the census of 2000, there were 21,906 people, 8,713 households, and 6,186 families residing in the city. The population density was 1,221.2 people per square mile (471.5/km²). There were 9,315 housing units at an average density of 519.3 per square mile (200.5/km²). The racial makeup of the city was 92.81% White, 4.46% Black or African American, 0.39% Native American, 0.56% Asian, 0.05% Pacific Islander, 0.75% from other races, and 1.19% from two or more races. 1.90% of the population were Hispanic or Latino of any race. There were 8,713 households out of which 33.5% had children under the age of 18 living with them, 55.9% were married couples living together, 11.8% had a female householder with no husband present, and 29.0% were non-families. The average household size was 2.46 and the average family size was 2.95. In the city the population was spread out with 25.3% under the age of 18, 8.8% from 18 to 24, 29.8% from 25 to 44, 21.5% from 45 to 64, and 14.7% who were 65 years of age or older. The median age was 36 years. For every 100 females there were 91.5 males. For every 100 females age 18 and over, there were 88.1 males. The median income for a household in the city was $41,503, and the median income for a family was $51,064. Males had a median income of $32,493 versus $22,386 for females. The per capita income for the city was $19,797. About 5.8% of families and 8.6% of the population were below the poverty line, including 9.9% of those under age 18 and 11.5% of those age 65 or over. Benton School District, which leads to graduation from Benton High School. Harmony Grove School District, which leads to graduation from Benton Harmony Grove High School. Bryant School District, which leads to graduation from Bryant High School. Billy Bob Thornton, writer, director, and star of the 1996 American drama film ‘’Sling Blade’’ used Benton as the location for many scenes. The climate in this area is characterized by hot, humid summers and generally mild to cool winters. According to the Köppen Climate Classification system, Benton has a humid subtropical climate, abbreviated "Cfa" on climate maps. ^ "Benton (Saline County)". The Encyclopedia of Arkansas History & Culture. The Central Arkansas Library System. http://www.encyclopediaofarkansas.net/encyclopedia/entry-detail.aspx?entryID=979. Retrieved 4 July 2014. ^ "Kenneth L. Henderson". intelius.com. http://www.intelius.com/results.php?ReportType=1&formname=name&qf=Kenneth&qmi=L&qn=Henderson&qcs=Russellville%2C+AR&focusfirst=1. Retrieved April 8, 2015. This page uses content from the English language Wikipedia. The original content was at Benton, Arkansas. The list of authors can be seen in the page history. As with this Familypedia wiki, the content of Wikipedia is available under the Creative Commons License.